Refreshing and calming. 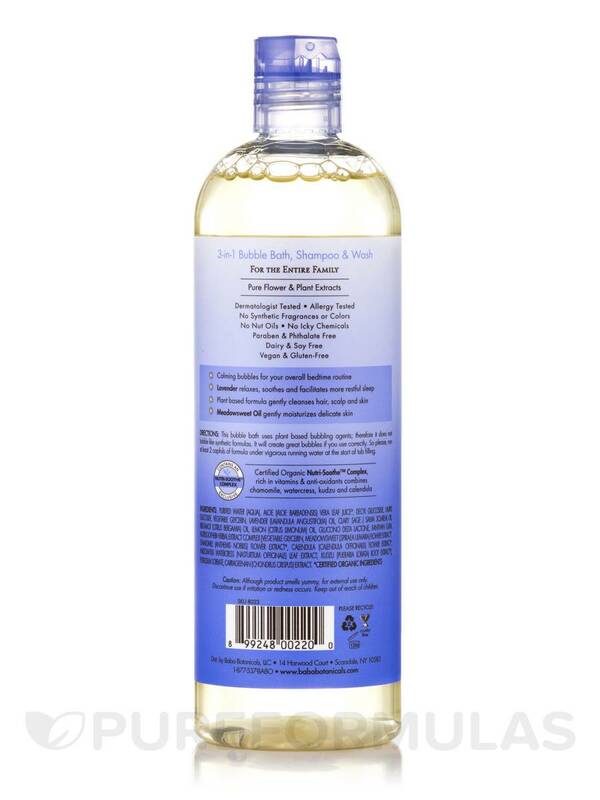 If you want a relax bath and wash you get Calming Shampoo Bubble Bath and Wash Lavender by Babo Botanicals. Calming bubbles for your overall bedtime routine! - Lavender relaxes‚ soothes and facilitates more restful sleep. 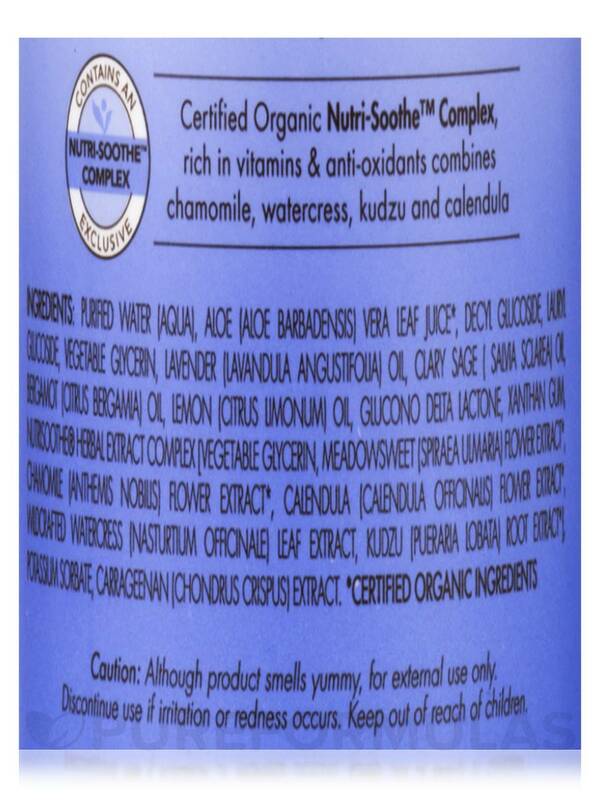 - Plant based formula gently cleanses hair‚ scalp and skin. - Meadowsweet Oil gently moisturizes delicate skin. Certified Organic Nutri-Soothe™ Blend rich in vitamins and anti-oxidants combines Chamomile‚ Watercress‚ Kudzu and Calendula. Purified water (Agua)‚ Organic Aloe Barbadensis (Aloe) Leaf Juice*‚ Decyl Glucoside‚ Lauryl Glucoside (from sugar)‚ Glycerin (Vegetable)‚ Natural Lavender-Melon Essential Oil Blend‚ Glucono Delta Lactone (natural ferment of sugar)‚ Xanthan Gum‚ Organic Meadowsweet (Spiraea Ulmaria) Extract*‚ Organic Anthemis Nobilis (chamomile) Flower Extract*‚ Organic Nasturtium Officinale (Watercress) Extract*‚ Organic Pueraria Lobata (Kudzo) Root Extract‚ Potassium Sorbate (food grade preservative)‚ Chondrus crispus (carrageenan) extract. Free of: Sulfates‚ parabens‚ phthalates‚ synthetic fragrances / dyes‚ sodium chloride‚ formaldehyde‚ MEA/DEA/TEA‚ high allergy nut oils‚ soy‚ dairy and gluten. Created on a farm in the USA. 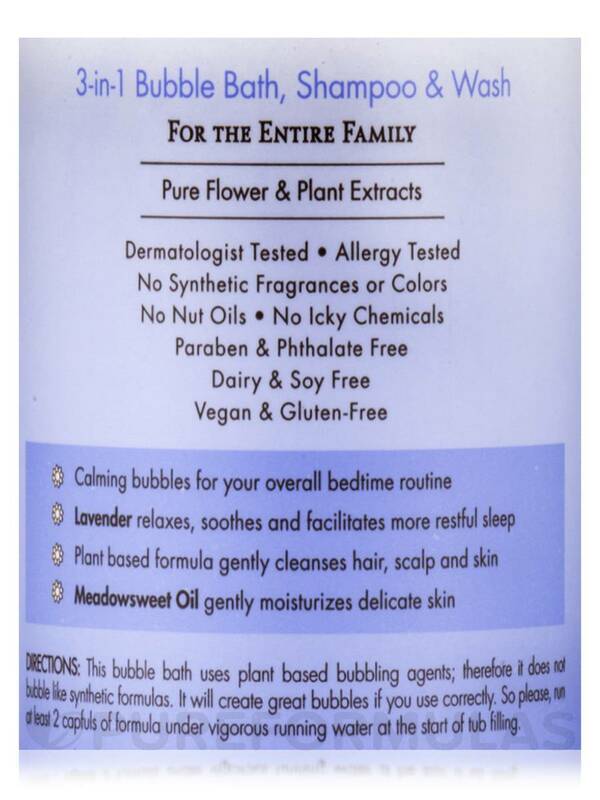 This bubble bath uses plant based bubbling agents; therefore it does not bubble like synthetic formulas. It will create great bubbles if you use correctly. So please‚ run at least 2 capfuls of formula under vigorous running water at the start of tub filling. Although product smelly yummy‚ for external use only. Discontinue use if irritation or redness occurs. Keep out of reach of children. 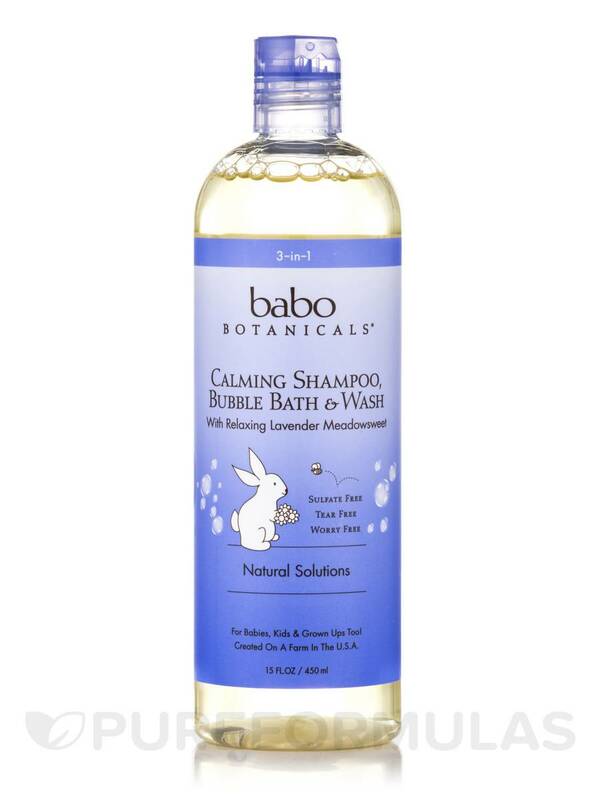 Calming Shampoo Bubble Bath and Wash Lavender by Babo Botanicala is worth every penny!